For Daily Meditation, Journal Writing, or Just Because! Transformation can occur only when you take the time to reflect and turn inward. Whether you are starting on your spiritual path or have a strong, daily practice, use these cards to hear and follow your brilliant voice within. The images of nature remind us of our inner wisdom, our innate state of balance and truth, and our connection to all living beings. Use them to help witness your own inner healing and deep awakening. 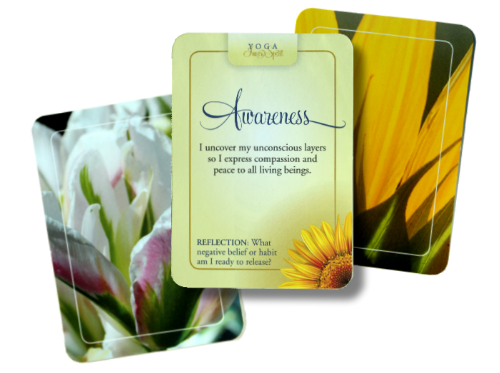 Contemplate the card’s word, text, reflection question, or the photograph on the other side. Angela’s unique words and original photography will inspire you to trust and follow your own intelligence. Angela, I just wanted to send you a quick email to say I’m LOVING your reflection cards. WOW! I draw one every day, and post on my fridge; incidentally, my card drawn today was “Presence: soul aligned with universal consciousness”, so true at my time in my life. You are so gifted “sister”…hope you continue to do what I think is a divine gift of creation in the making. Hi Angela, I did not realize that you made those yoga cards: they are so cool! We have been playing with them and pull out a few before bed time, also in the morning! Strangely, sometimes it is hard to answer the questions, but when you do, it really makes you realize things you otherwise wouldn’t think much of or perhaps trying to avoid.